Koh Rin is the southern most of Pattaya's outter islands, it has several good dive sites. Hin Khao or "north rock" has several rocky outcrops that provide shelter for eels and rays. Many gorgonians and whip corals to be found here and on closer inspection you'll find nudibranchs and other small reef critters. 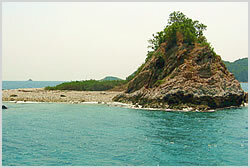 Hin Don Mai or "south rock" has a bigger variety of coral and fish life. Morays can be found here amongst the corals. Koh Rin is small and currents can be strong here however there is a sheltered little bay for that relaxing dive.